This beautifully designed bracelet is a strong meditation tool as well. AND MEDITATE FOR THE ENERGY YOU WOULD LIKE TO ACTIVATE! were wrapped around Rachel's Tomb 7 times and prayed over by Kabbalists. 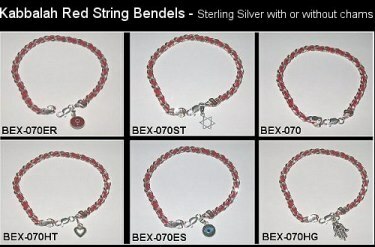 The Red String protects us from the influences of the Evil Eye. Evil eye is a very powerful negative force. Quantum physics teaches that we are impacted by others around us. Imagine the impact if another is envious of you? Connecting with the energy of the Matriarch Rachel raises our attention to divine Love and caring warding off the evil stares. The Holy Bible teaches us of the unique compassion of the Matriarch, Rachel, the wife of Jacob, who after many barren years, gives birth to two sons, Yosef (Joseph), and later Binyamin (Benjamin). During the latter birth, Rachel passes from this world, and is buried on the road between Jerusalem and Bethlehem. The prophet Jeremiah singles out Rachel as the compassionate mother who weeps at the departure of her children from the Holy Land during the Babylonian exile, promising them that they would return to the land of their fathers, and to her presence, in the future. An ancient tradition teaches us that a red string, wound seven times around Rachel's Tomb, is endowed with mystical powers. According to this tradition, by tying the string around his or her wrist, the wearer is protected from the destructive power of the Evil Eye, thus preventing disease, poverty, accidents or other misfortune from befalling the wearer. Connecting with the energy of the Matriarch Rachel raises our attention to divine Love and caring warding off the evil stares. When you use The Red String with the awareness of Rachel the Matriarch and provided powerful meditations you will be surrounded by the full force of protection she manifested in our physical world. Copyright © 2002 by New Thought Kabbalah All rights reserved. Revised: 30 Nov 2010 13:44:41 -0500 .